Celtic Dragons have switched their netball Superleague fixture against Strathclyde Sirens to Cardiff Met University. Captain Nia Jones and her Dragons usually play at the Sport Wales National Centre in Cardiff, but they will take on Glasgow-based Sirens at the Cyncoed Campus. The change of venue means additional tickets are available for the Vanarama National League following two 650-plus sell-out matches at the Dragons’ regular venue. Cardiff Met is Dragons’ official training headquarters and coach Tania Hoffman says: “It is fantastic to be able to play a Superleague fixture at our training home. Dragons, currently seventh in the Vitality Netball Superleague table with 12 points, play Sirens on Saturday, April 13 (4pm). Centre Kyra Jones in possession for Celtic Dragons. They make the trip to play Manchester Thunder this Saturday aiming to bounce back from the their dramatic home 52-53 defeat against Severn Stars. The Welsh team were in control, but slipped up after losing shooter Chelsea Lewis injured at the start of quarter four and that seemed to disrupt the home teams flow. “We are frustrated and disappointed to have been up by eight goals and lose by one,” said Hoffman. “I didn’t think the change at goal shooter would have mattered, but we as a team have to learn to play players into the game when they come off the bench. The reaction of Dragons’ Australian centre Kyra Jones: “Sport is not very nice sometimes.. it can be heart breaking in fact. Suzy Drane tweeted: “Reflection time is a wonderful thing We saw passages of play that were so good against Stars they gave me goosebumps, moments of brilliance you just can’t teach. Wing-attack Suzy Drane suffered a calf pull in the pre-match warm-up and Bethan Dyke took over. Dragons were clinical in attack and produced some good work in defence, particularly a couple of tips from Stacian Facey. 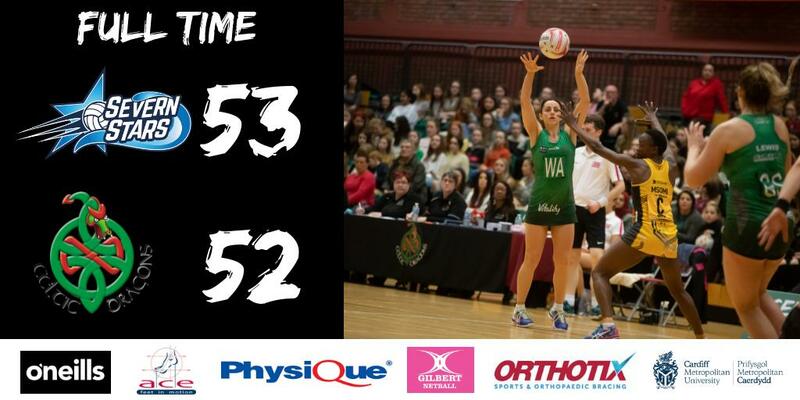 They led 44-39 going into the final 15 minutes, but Chelsea Lewis went off injured and Eleanor Roberts went on. Roberts immediately scored her first and there was little wrong with her radar, but the teams manner of play seemed to change. Dragons were far less assertive in attack and with some ridiculous passes being flung up from mid-court, Stars could sense an opportunity. Within a four minute period, Stars overturned a 5-goal deficit to lead as the Dragons started to lose touch with reality. With five minutes left, Lewis was able to return to court, but by this time the team was in disarray. Dragons produced a frantic last couple of minutes Stars, but were able to grind out their unlikely victory. Celtic Dragons: GS C Lewis, GA K McCollin, WA S Drane, C K Jones, WD N Jones (capt), GD D Bolakoro, GK S Facey. Reps: B Dyke, C Elsley, E Nawele, E Roberts, A Tyrrell. Severn Stars: GS G Rowe, GA M Holtzhausen, WA I Darroch, C L Harris, WD E Powell-Davies, GD J-A Ward, GK S Cook. Reps: CL Moseley, A Muskwe, S O’Dwyer. Dragons results/fixtures 2019 – home games played at the Sport Wales National Centre in Cardiff. Saturday 3 v Strathclyde Sirens (home, 4pm; to be played at Cardiff Metropolitan University’s National Indoor Athletic Centre, Cyncoed Campus). Tickets for ‘Celtic Clash II’ at Cardiff Met can be purchased from celticdragonsnetball.ticketline.co.uk and there is a 10% discount for groups in multiples of 10. Contact Ticketline directly on 0161 813 2222.